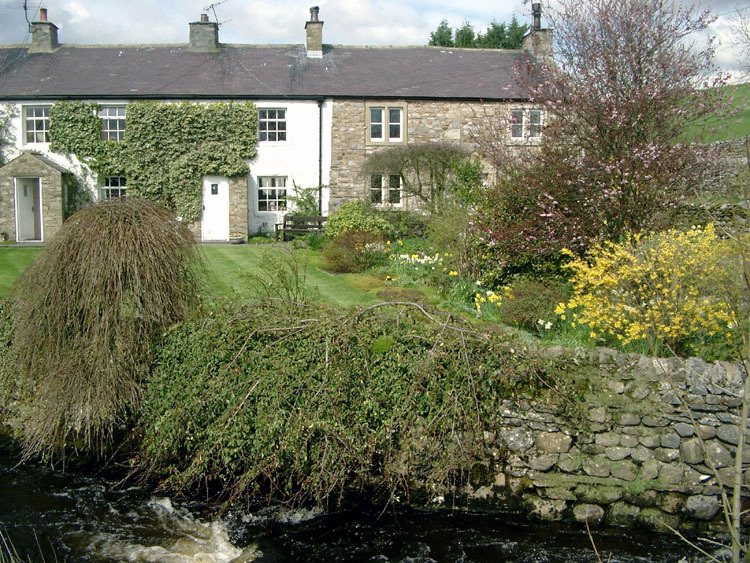 After a couple of days rest, spent visiting Alston and Penrith and logging a few Geocaches (if you don't know what I'm talking about, look at geocaching.com) Chrissy and I were to be found at the planned B&B in Dufton: Brow Farm. Brow Farm is very much a walkers' stopover, and there were several Pennine Wayfarers spending the night there. As far as I could tell, they were all South to North walkers: few walk in the opposite direction, sadly. In the morning I was very keen to start walking again. Today would be the highlight of the E2, with High Cup Nick, Cauldron Snout and High Force on the agenda. I was hoping for clear weather: I'd never been to High Cup Nick before, and had been looking forward to seeing it for at least 30 years. Unfortunately the day was not going to co-operate, and I set off at 8.40 with thick, low cloud ahead. I was expecting a hard time on the ascent to High Cup Nick, as the gradient is relentless for more than three miles from Dufton. As it turned out, the hill is quite steady, and except for a couple of short steep sections can be taken at a reasonable pace without too much effort. I met the cloud at about 1300 feet, and had to don an extra layer as there was a cold breeze as well. At the edge of High Cup Nick (Narrowgate Beacon) the going was very easy but the mist was too dense to see the spectacular gorge just a few yards away, except for a few glimpses of the cliffs lining the edge. I managed to get a photo of the landmark Nichol's Last, named after a Dufton cobbler who soled and heeled a pair of boots on the summit. But the mist remained dense, with an accompanying light drizzle, and I moved on quickly past the Nick. 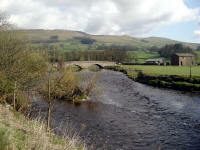 The route to Maize Beck splits here, the longer version being safer when the back is in spate. Although it had been very wet over the previous month and was gently raining as I walked, I judged that the beck could be crossed without the footbridge: and so it proved. The problem going south is that if you make a wrong decision here and are then unable to cross, it is a long walk back to the footbridge. 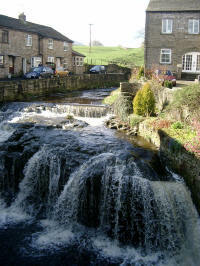 To try and cross when the beck is in spate would be foolhardy and has been the cause of trouble in the past. As soon as Maize Beck appeared, the cloud lifted and the drizzle abated. For a mile I followed the right bank of the stream, all the time looking out for the crossing point. At last I found it (at Grid Ref NY 76863 26744) and stepped across to the other bank. I was pleased to note that it was only half past ten, as there were still sixteen miles left to walk. The track to Cauldron Snout was good steady walking: although a very string wind had sprung up it was in my direction and helped me along. The wind made the lonely dwelling of Birkdale seem particularly bleak, the only other human feature around being the flags of the army firing range. 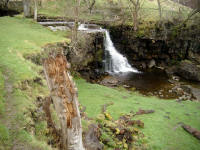 By 11.30 I was at Cauldron Snout: one of the most spectacular waterfalls in the Pennines. It's tamed nowadays by the steady water supply from Cow Green Reservoir but at least there is always a reasonable display of water. The basalt columns make for a slippery path down the side of the falls, and in the high winds I had to take special care but soon I was on the soft meadows at the foot of the falls, and looking forward to an easy walk along the Tees. Firstly, however, I had to negotiate the notoriously tricky path along the foot of Falcon Clints. In places this is like a boulder beach at low tide, as you hop from wet rock to wet rock, and requires concentration as you have to plan each move in advance. At Holm Wath the path opens out into easy walking, although a diversion at Widdy Bank Farm caused some confusion. 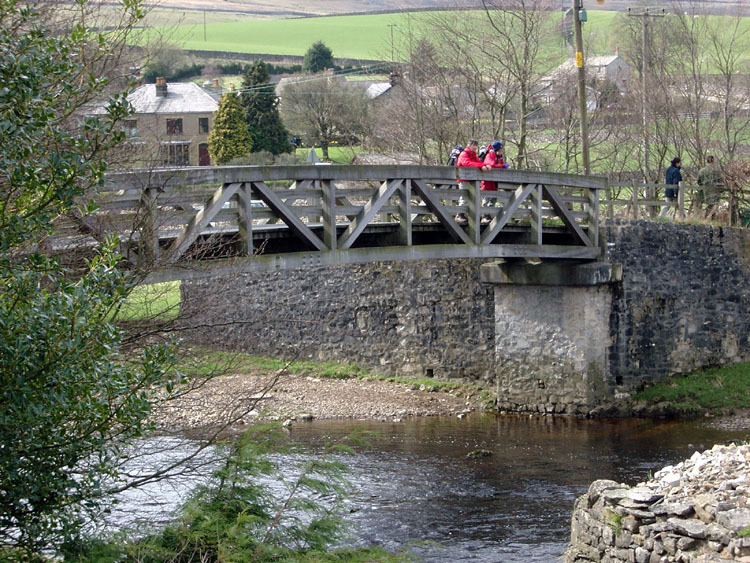 After re-crossing the Tees at the footbridge near Forest In Teesdale, fourteen miles had passed and I took a small lunch of Kendal Mint Cake and water. By ten to two I was at High Force: suddenly there were dozens of tourists around and after the bleak hills I felt as if I was in a city centre. The Pennine Way keeps to the southern bank, which does not include the optimum viewing position for Britain's biggest (though not highest) waterfall. But you don't have to pay, and the views are still superb! There are several good viewing points along the path, although you have to watch out for the sudden drops hidden amongst the trees. The path along the valley to Middleton is delightfully rural and sheltered, and the day felt much more warm and pleasant than earlier. Low Force is a much less spectacular fall, as you'd imagine, but very pretty all the same. At half past three I was approaching the bridge across the Tees at Middleton In Teesdale. After a short walk into the village centre, I met up with Chrissy and my parents at the Brunswick House Hotel. I had my doubts about this place: my parents had arrived the night before and had mentioned that there was a lot of noisy drilling going on, as there was renovation work. In fact, we had an excellent evening there: the proprietor cooked a fantastic meal, and we sat in the cosy lounge afterwards enjoying the luxury of being waited on whilst virtually having the place to ourselves. The renovation work didn't restart until after breakfast so didn't bother us at all. Chrissy and I had a stroll round the village in the early evening, and realised that the place looks very attractive but is completely dead as soon as the shops close. Our home village on the Isle of Man is much more lively and cosmopolitan: I expect that most of the locals rather like it quiet, but I can imagine that the younger generation of Middleton have to spend a lot of time travelling to the fleshpots of Barnard Castle. The Brunswick provided a first-class breakfast, probably the best so far, which fuelled me up for the day ahead. My parents were moving on, so we said our goodbyes and I set off along the main street in Middleton on a fine bright morning, reaching the Pennine Way at the Tees bridge at about ten o'clock. Chrissy drove past before I left the main road, on her way to a few hours in Barnard Castle before heading up to the Tan Hill Inn. 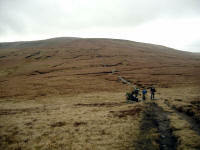 A steep slog up Harter Fell led pleasantly to a section which required careful navigation, down to the B6276. The strong winds certainly drove out any cobwebs, and the fisherman at Grassholme Reservoir looked to have a difficult task ahead, casting against the blustery breeze. 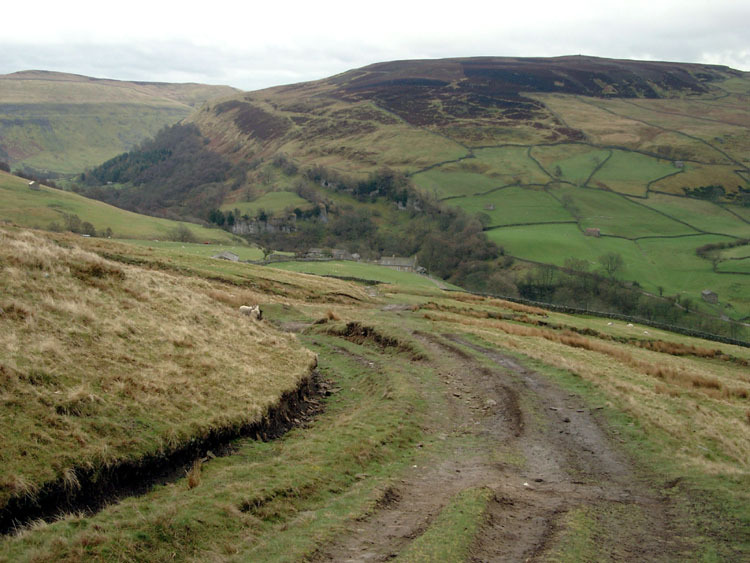 A couple of miles of typical Pennine country led across the boggy Mickleton Moor, and over Hazelgarth Rigg to the road above Hannah Hauxwell's Birk Hat. 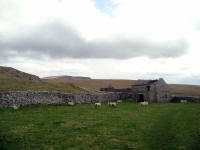 Hannah was made famous by a television series depicting her isolated life in this remote farmstead, and her reaction to city culture. Now she has moved to a small house further down the valley, but the meadow she farmed is now managed by Durham Wildlife Trust. On a fine day like this, I could appreciate why she was happy to stay within the confines of the farm and meadows. 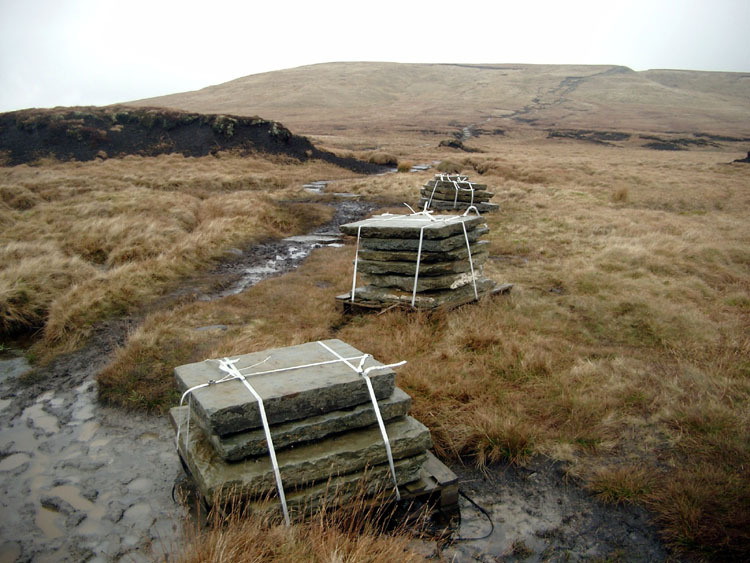 A good track led past Birk Hat and down towards the reservoir: in the bank I found another geocache - perhaps the most convenient one along the Pennine Way. 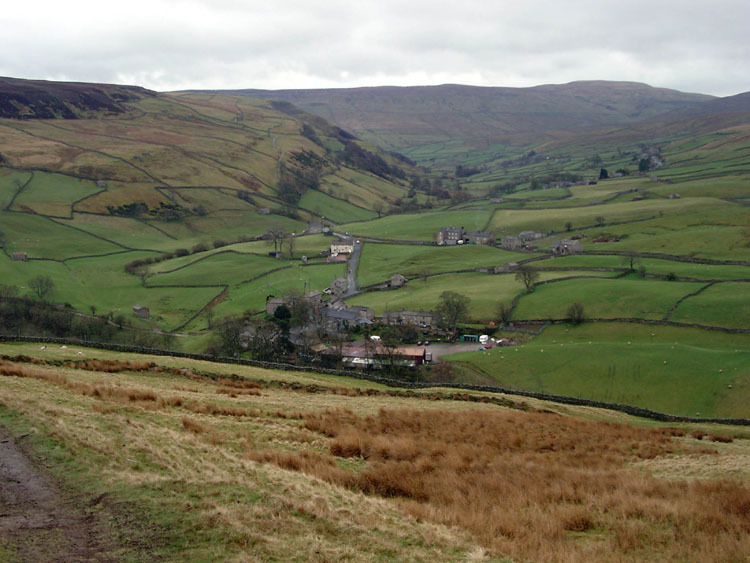 The valley here, Baldersdale, marks the halfway point of the Pennine Way. I crossed the bridge over the western end of Blackton Reservoir: dammed in 1896, the reed beds are important for wildfowl and make the water more attractive than the usual bleak artificial lake. The track led past the pleasant Clove Lodge, then headed suddenly across the grassy Cotherstone Moor. 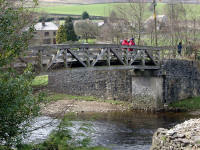 A featureless couple of miles led to the well-constructed footbridge at the small beck in Deepdale. The bridge was hardly necessary for me, despite the damp spring weather, but the catchment area of the beck is huge and spates are probably frequent and fierce. The next landmark was Ravock Castle, which I reached at half past one. This was a big disappointment as there is nothing really there, and previously it had only been a sheep shelter - rather over-named, I think! The noise of traffic announced the entry of the A67 into the route. 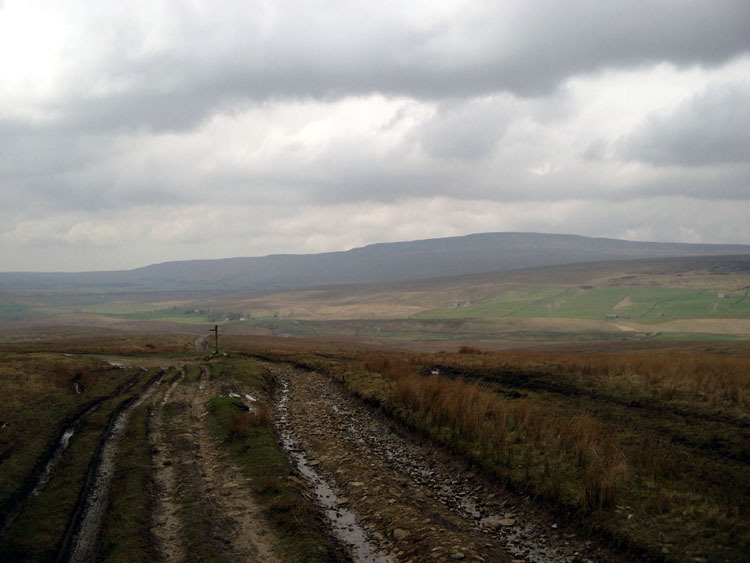 This is a big and fast road where the Pennine Way crosses it, and the tunnel is essential for those carrying too much weight (on back or waist) to sprint across. From the road, a short descent led to God's Bridge - a natural limestone bridge with a convenient level top, crossing the river Greta. There is an alternative route here, via Bowes, but with only six and a half miles to go I was ready to slog up the incline to Tan Hill. At first the route lay through fields, on a high open bank next to the river, then a steep descent led via a footbridge to the road at Sleightholme. The sky went dark with thick cloud, and rain began falling, getting heavier as I struck out from the good track on to a rougher path across the moor. 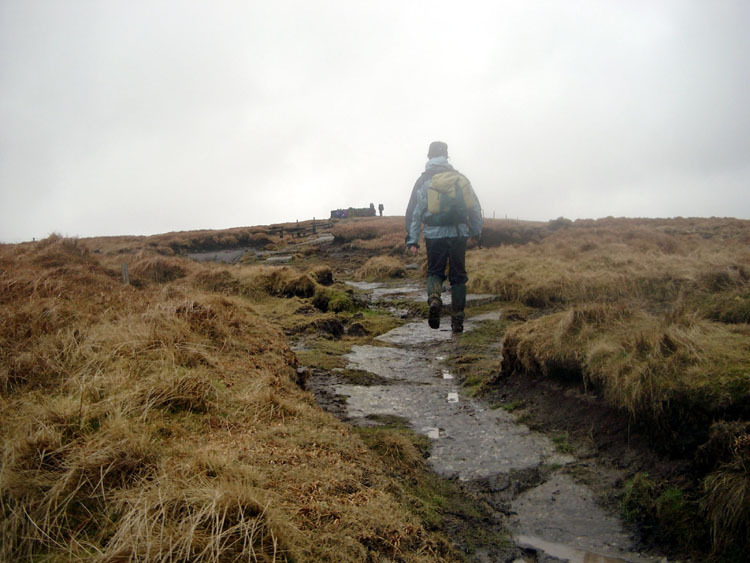 Though the rain eased off from time to time, the walk was quite damp underfoot and the way became progressively more difficult as I ascended the moor. The final section before Tan Hill was awkward and boggy ("oxtail soup" ground according to Wainwright), and I was glad to get onto firm ground against the Inn. I arrived at the Tan Hill just after four o'clock: with head down into the weather, and boggy ground, I'd still covered the last four miles in just over an hour. 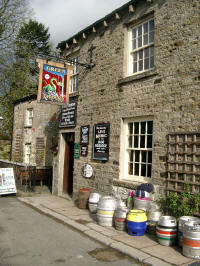 The Inn was very welcoming, with a good log fire ablaze and a huge selection of tempting drinks. I sank four half-pints of apple and mango juice before betting showered and changed. There is nothing else near the Tan Hill, but Chrissy and I did not mind spending the evening relaxing in its unique atmosphere. There were plenty of people in, and a parrot to amuse the strangers. A good old pub breakfast started the day - the motivation level was slightly down after I looked out of the window and noticed the damp conditions and heavy cloud. 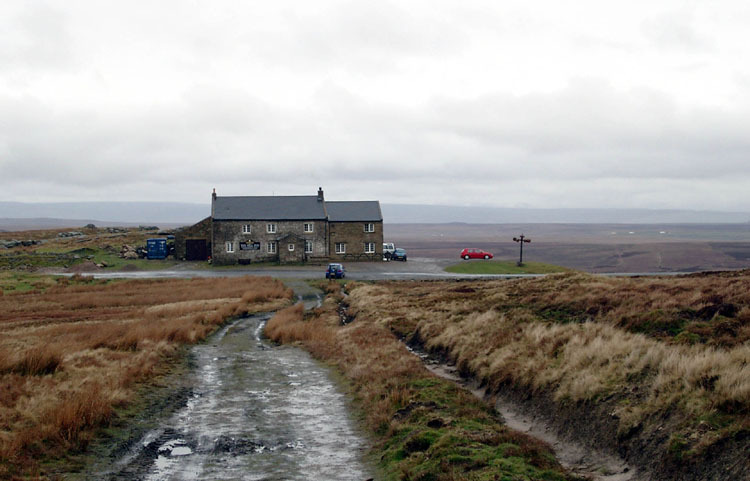 It was still a pleasure to get going, although we enjoyed our stay at England's highest inn. I left at 9.30, with a short but hilly walk ahead. 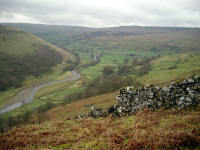 It was novel to begin at such a high level, with an easy descent into Swaledale. Although the moorland is dull here, with much evidence of mine workings, it was encouraging that the weather wasn't getting any worse and the going was good on a well-maintained path. An exciting moment here was the first view of real Yorkshire Dales country, and a feeling of real progress - Scotland suddenly seemed a long distance away. After an hour and a quarter I was in the valley, passing the gushing waterfall of East Gill Force and getting confused with the path at the Swale. 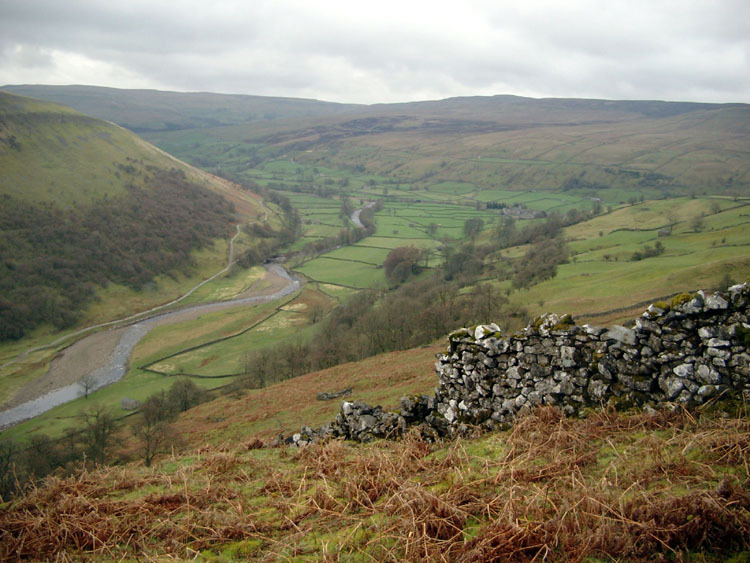 The Pennine Way rises quickly on the other side of the dale, and follows an awkward and slippery rocky path around the "island" of Kisdon. Although the views down the widening dale are marvellous, it's wise to stop to have a look rather than getting distracted when moving as the going is tricky when damp (as today). 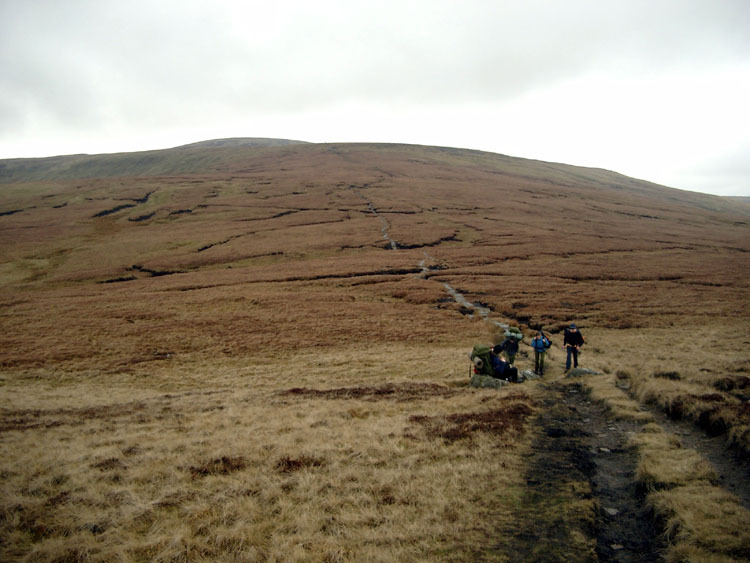 On the map, this section looks like being fairly level after the initial ascent, but in practice there is quite a bit of climbing to be completed before the reward of a steep descent into Thwaite. 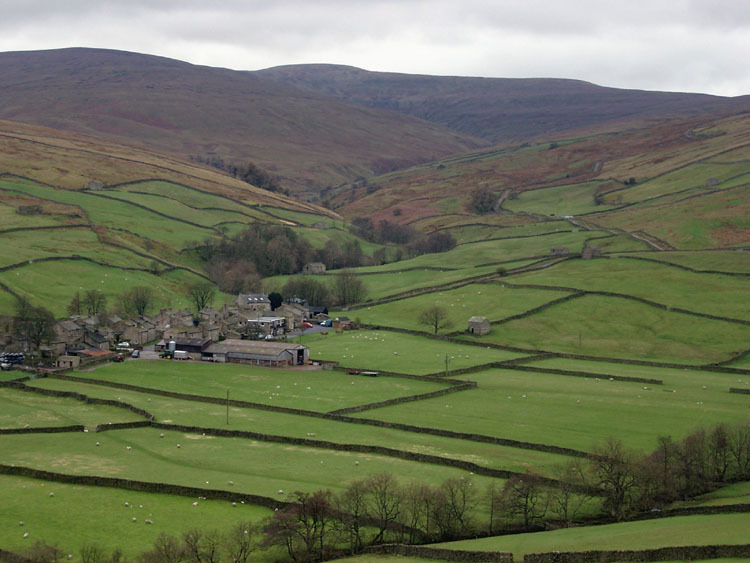 I imagine the settlers who named the villages around here to be rather terse and abrupt types "Keld" and "Thwaite" being minimalist versions of common Norse names. Perhaps the reputation for terseness held by the present incumbents is inherited. 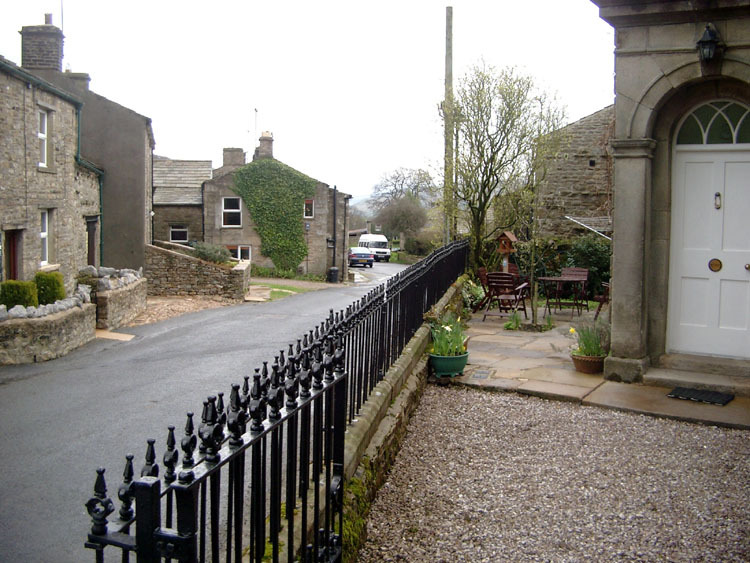 The sky had cleared a little by the time I reached the pleasant village of Thwaite, and it was a relief to wander up the main street - the first village since Middleton. Ahead, Great Shunner Fell loomed: I'd crossed this once before (more than thirty years earlier) and remembered the peat hags and bogs well. After such a wet spring, I was expecting difficult walking over the top. 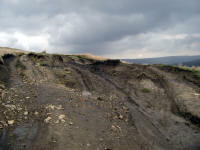 The track began easily up a lane which had been severely eroded by vehicles (it's the one that says "No Vehicles"!). 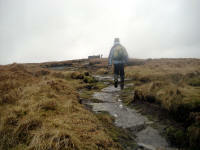 Soon, the moor opened up ahead, and a slog led to the summit of Bleaberry Head - reached at one o'clock. 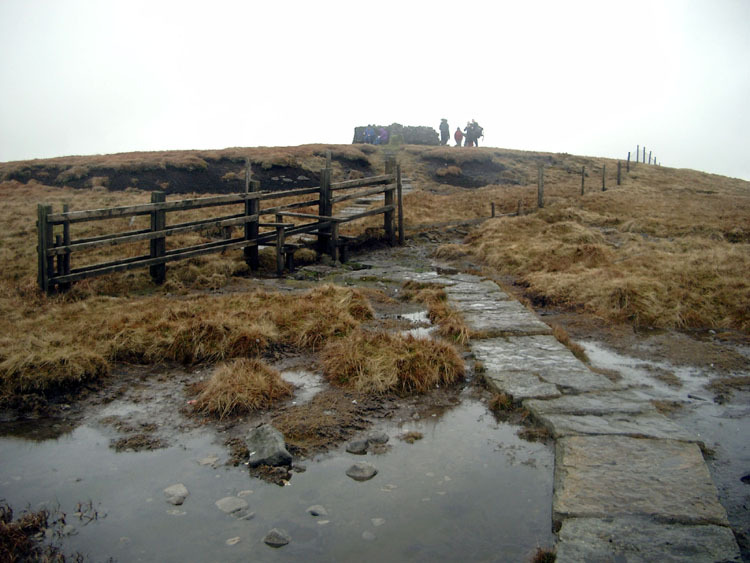 Surprisingly for a Friday afternoon, there were many walkers about and it was interesting to see the variety of ages (teenager to elderly) willing to spend a few hours on a damp wilderness in the Pennines. 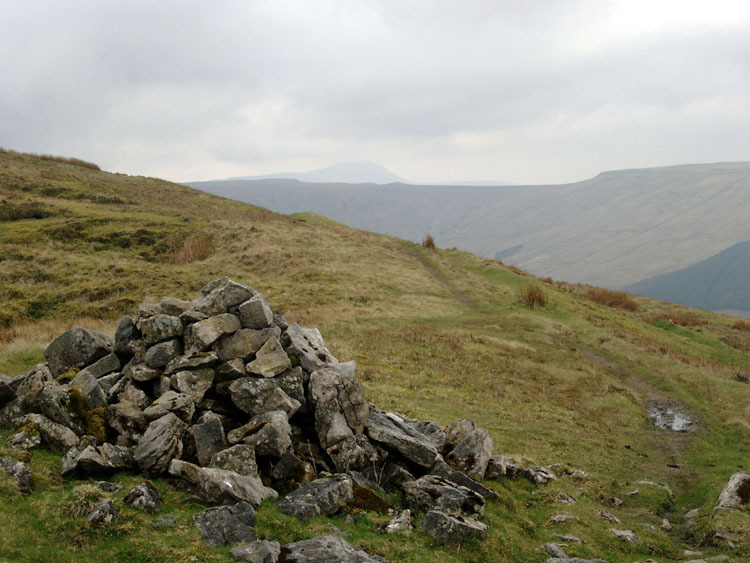 The path was the familiar flagstones: although hard on the feet, I never "shunned" them across the hill as they made progress quick and straightforward (and dry). The gradient was steady, except for a sharp steepening near the Beacon. 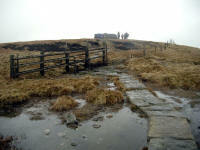 The top of Great Shunner Fell (2344 feet, 716 metres) felt bleak and inhospitable as the rain had returned. Or at least it did until I overheard another party chatting merrily about the price of a set of knives they'd bought for a wedding present, which seemed slightly at odds with the situation. 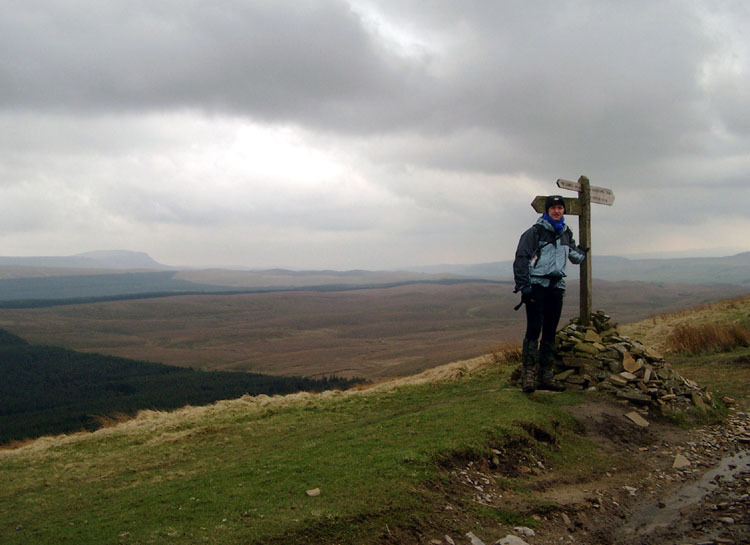 I left the summit at 1.30 and began the easy descent down the curving ridge into Wensleydale. 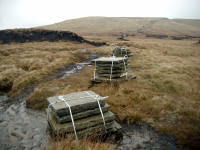 With plenty of flagstones and an amenable slope the descent went quickly and I was at Hardraw before three o'clock. 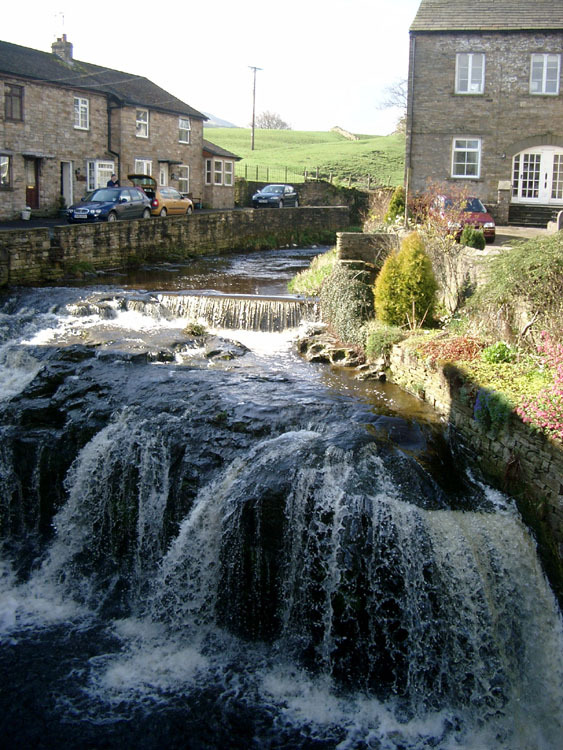 We were staying at the Green Dragon, which is also the entrance to the famous Hardraw Force waterfall (England's highest with a single plunge of 96 feet). We had visited the fall earlier in the year so didn't bother this time, choosing to concentrate our energy on the pub instead. 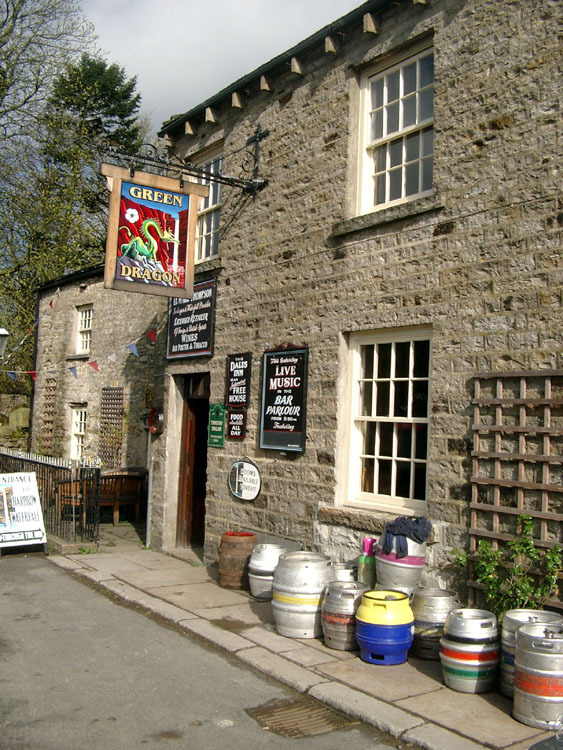 The bar area is a comfortable room with a huge open fire and a traditional stone floor (and great beer). The hotel part behind the pub is a rather dilapidated extension, and we caught the management on a bad day. Although the room was a good big one with a large bathroom, there appeared to be no hot water so I had a cold wash. The proprietor was struggling to finish preparing rooms, despite the hour, and I didn't want to complain as I suspected that the hot water would be turned on later. We had more luggage in the car, and I went to retrieve it - much to the consternation of the manageress who thought we'd decided to leave (I suspect that has happened a few times...). Back in the bar, we were served with some great pub food and sat contentedly in front of the blazing fire, watching the rain which had begun pouring down determinedly. I was amused to observe the increasing flow of rainwater through the ceiling into a bucket at the side of the bar. The hot water situation had to be solved by the manageress wading into deep water in the flooded cellar and replacing the pump so the cellar water could be cleared and the heating restarted! At a chance meeting in Port Erin a month later with the previous owner of the Green Dragon I learned that the cellar flooding is a perennial problem, and that he'd sold the pub many years ago because of the urgent need to renovate the hotel part. Breakfast was not one of the greatest but was sufficient, and with the sun shining I was quickly under way. The meadows were delightful in the morning sun, and I was soon through Hawes and into the charming back streets of Gayle. As this was the last day of the trip, I planned to meet Chrissy in Horton in Ribblesdale in plenty of time to drive to Liverpool, returning to the Isle of Man by Sea Cat that evening. 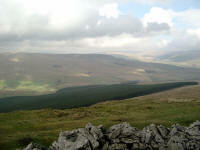 So I was determined to keep a good pace going and was soon at the top of the hill above Hawes (Ten End). It was still a fine day, although cloud was starting to dominate the sky and the string breeze had a bracing edge to it. After the summit of Ten End a steady track led over Dodd Fell to an unexpected group of parked cars on open grassland at nearly 1900 feet. 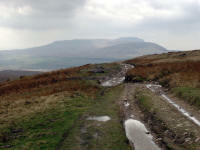 From the end of the tarmac a wide track led steadily downwards across Cam Fell. 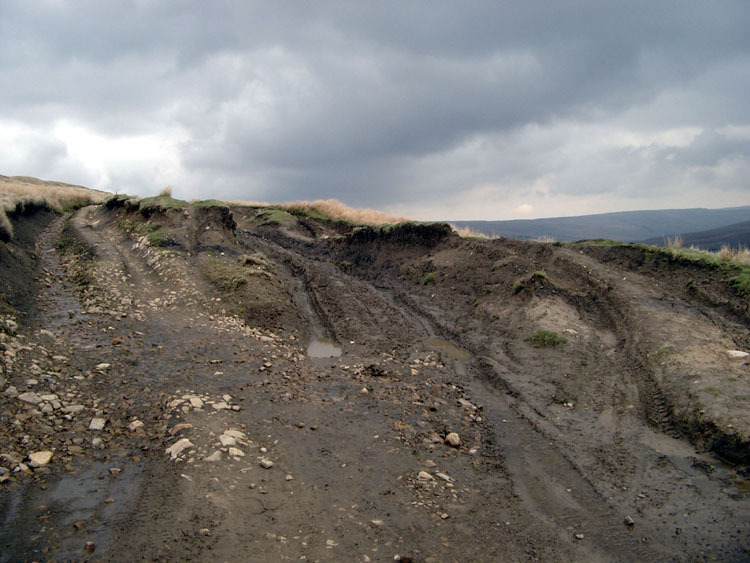 Several long-distance routes use this section, and the track is ludicrously churned-up from over-use by cars, bikes and even tractors. The walker has to pick a route through trenches and ruts, until the turn-off at Cam End where the surface becomes more pleasant again. The feel of this area is similar to South-West Scotland, with vast spaces between big hills, and little sign of habitation. The Three Peaks of Whernside, Pen-y-ghent and Ingleborough dominate the skyline, the upper Ribble valley like a desert inbetween. 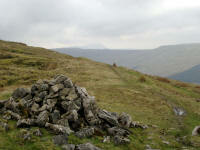 From the high hills, I was quickly into more rural countryside with the appearance of Ling Gill. This little oasis is preserved as a nature reserve, and its tree-lined limestone gorge is a haven for wildlife. 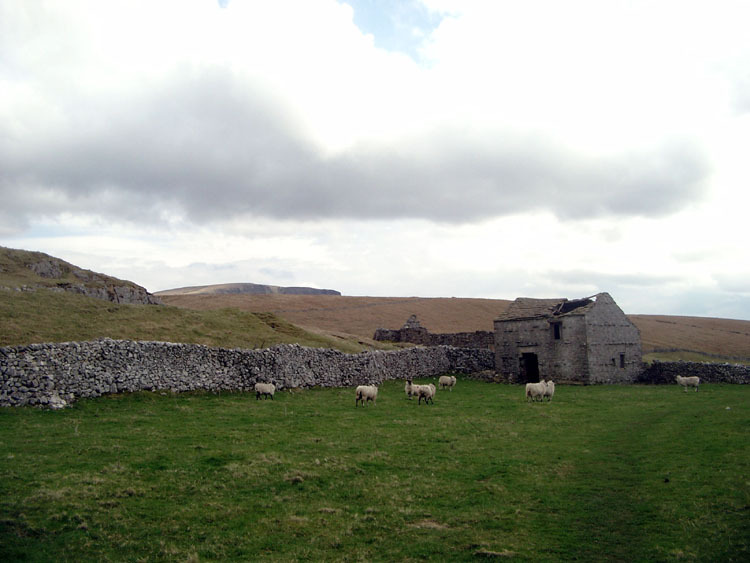 Heading south, a typical Dales lane with limestone dry walls led to the grassy pastures above the Ribble, an area of green and grey where the rock dominates as much as the grass. I took a diversion where the Way suddenly zig-zags east and south: by following the Ribble Way I was able to visit Birkwith Cave and collect the nearby geocache. 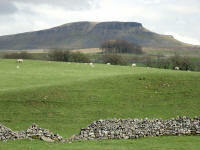 I kept to the Ribble Way through Middle Pasture, until the Pennine Way re-joined at Sell Gill Holes. Another stony lane, and I was at the B6479 in Horton in Ribblesdale. 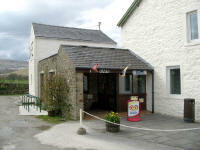 Five minutes I met Chrissy at the Pen-y-ghent Cafe: a walkers haven with snacks and hot drinks. The owner had not heard of the E2, and was intrigued: I wonder how many E2 walkers he will see during his tenure? 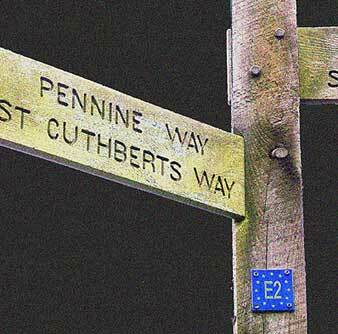 I signed the Pennine Way book, and changed into "civvies" ready to head home. Though not tired after such a short and straightforward walk, my feet were sore (yet again) so I was ready for some recuperation. 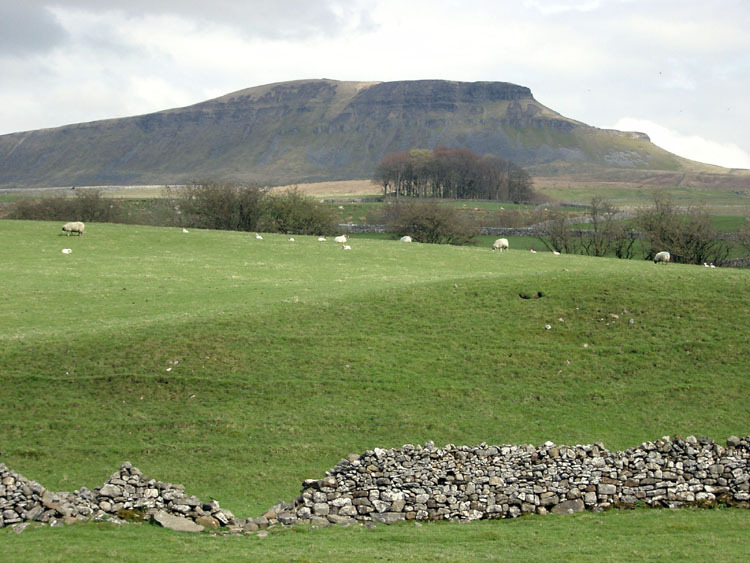 The next visit to the cafe would be prior to the ascent of Pen-y-ghent: perhaps the most distinctive mountain in England.